Joy Ann Havran, the only child of Joy Ellington Weaver and Martin Weaver, has roots to Shelby County that date to 1886 when her great grandfather Sam Weaver with others rode on horseback with an ox cart to Shelbyville and took the county records back to Center, establishing Center, Texas, as the county seat of Shelby County. Her father, Martin Weaver owned, along with his brother, and managed Weaver Brothers Lumber Company and developed the subdivisions of Greenwood and Lakewood. He was instrumental in bringing the Poultry Industry to Shelby County in 1948 designing the first 3000 foot long style broiler house, building and financing it. He went on to build over 2000 such houses in East Texas in seven counties during the late 1940s to the 1970s. Joy and Martin Weaver promoted tourism in East Texas entertaining scores of sports writers from across Texas who fished for bass with Martin at Toledo Bend where he built and financed Huxley Bay Marina. Joy Ann’s paternal grandparents, Stella Scruggs Weaver and Marion Weaver owned and operated Weaver Grain and Grocery which became Weaver Brothers Lumber Company. He signed the original charter to establish the First Christian Church in Center and the deed for improvements in 1931. 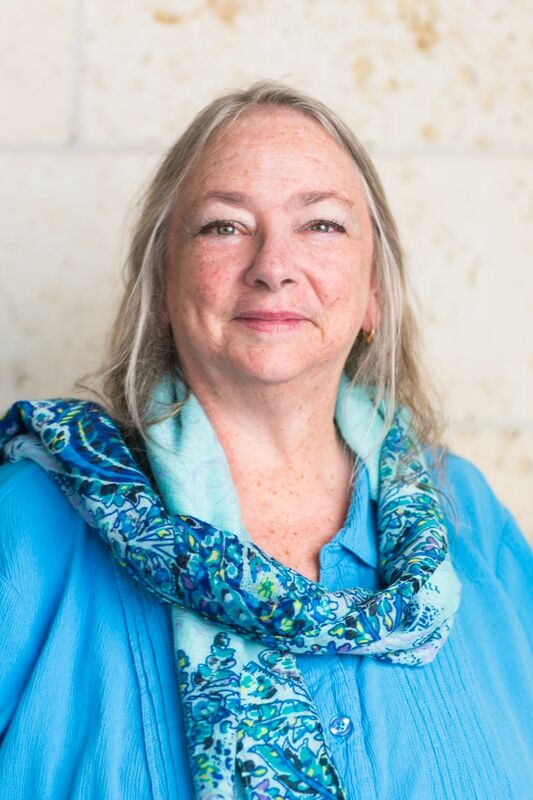 Her maternal grandparents were Verna Bell Ellington, originally of Patroon, and Dr. John Ellington, who practiced medicine in San Augustine and was also a doctor for the Santa Fe Railroad. 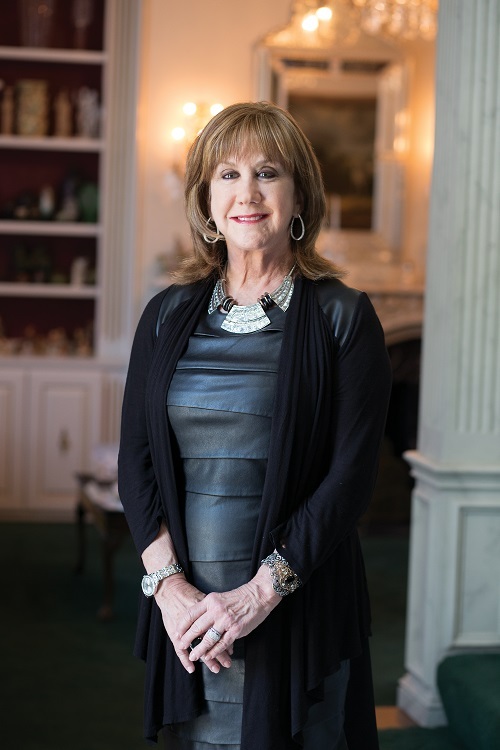 Joy Ann attended Center Elementary, Center Junior High and Center High School where she graduated Salutatorian of the Class of 1967. In high school Joy Ann was active in all phases of school life from twirling with the Center High School band to working on the school paper. Joy Ann has remained active in Shelby County for the past 50 years with her friends and by serving on the John Dean Windham Civic Center Committee to fund and design the Poultry Plaza, presenting her father’s scholarship at Center High School, co chairing the Class of ’67 reunions and managing timber and other business interests in East Texas where she continues to have a residence. 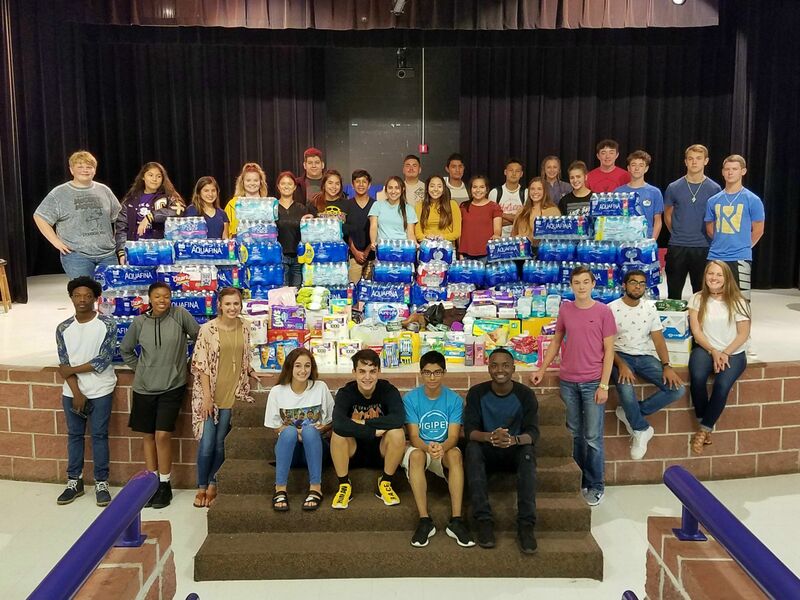 hurricane victims tomorrow after a successful student-led donation drive. meeting for the following day. We immediately began the donation process. several boxes filled with personal care items. hope that we can continue to be an example for others." donated items. The drive was executed quickly, and donations piled up fast. days we had overshot our goal by nearly 10 cases. I was amazed." SFA’s Business Office is hosting a retirement reception in honor of Bobby Williams, SFA bursar, from 3 to 4:30 p.m. today in the Baker Pattillo Student Center Regents’ Suite A.
Williams has served SFA for 22 years. All faculty and staff members are invited to attend the reception. A Special Meeting of the Board of Trustees of Center ISD will be held August 31, 2017, beginning at 12:00 PM in the Center Independent School District Administration Boardroom 107 PR 605 Center, TX 75935. Coffee With the Coach begins this Wednesday, August 30th from 6:15 a.m.
Board Room to discuss Roughrider Football. Reserved Seating – If you want to have your same reserved football seats this season, or are a first time buyer, please come by and see Sherri to secure your seating as soon as possible. Regular seating is $25.00 per seat and Senior Citizen seats (63 or older) are $10.00 per seat. Senior Citizen Passes – If you are 63 years young or older and would like a senior citizen pass, come by the Central Office Friday, September 1, 2017 at 10:00 a.m. Coach Therwhanger will be on hand to meet and visit with everyone. The Center Roughriders will take on the Rusk Eagles Friday in Rusk at 7:30 p.m. it will be broadcast on kdet 930 am. The Tenaha Tigers will take on the Joaquin Rams in Tenaha this Friday at 7:30 p.m. it will be broadcast on kqbb 100.5 fm and kxxe 92.5 fm with the legendary Don Wall. The Timpson Bears will take on the West Sabine Tiger in Timpson at 7:30 p.m. this Friday. The Shelbyville Dragons will take on the Elkhart Elks a home game this Friday at 7:30 p.m. The Garrison Bulldogs will take on TK Gorman an away game this Friday at 7:30 p.m.
Be sure to tune in Tuesday Nights to the Don Wall Coaches show on KQBB 100.5 FM. Tenaha ISD schools are in session. Tenaha ISD officials are monitoring road conditions and the weather. The safety of our students and staff are our number one priority. If conditions worsen and school is cancelled we will notify the community through local media including Shelby County Today, Light and Champion, East Texas Press, KGAS, Center Broadcasting (KDET) and all local TV stations. As of now the Tenaha vs Joaquin game is still scheduled for Friday, September 1st in The Pitt at 7:30 pm. Saturday, August 26th, marking the beginning their college experience. purchased their books, received their room keys and started moving in. cookies, cold water and snacks. the Fillies basketball team members. Meet the Dragons will be Tuesday, Aug. 29 @ 6:00 pm in the Shelbyville Gymnasium. SFA’s 16-time national champion cheerleaders are hosting the 2017 Cheer Kid's Clinic and Football Game Performance from 9 a.m. to noon Saturday, Sept. 16, at the Norton H.P.E. Complex on the SFA campus. Participants will meet at 5:20 p.m. on game day to perform at the SFA vs. University of the Incarnate Word football game at Homer Bryce Stadium. Children in grades kindergarten through eighth grade are welcome to participate. The cost is $55 per cheerleader. Register by Friday, Sept. 1, to ensure your child receives pom poms, a bow and a T-shirt. To register, click here. Day-of registration is from 8 to 9 a.m.
For more information, contact T.J. 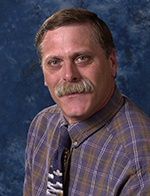 Maple, SFA spirit programs coordinator, at (936) 468-1604 or maplejv@sfasu.edu. An election will be held on November 7, 2017 for the purpose of electing a trustee for the Center Independent School District School Board. The Joaquin School Board held a public meeting at 5:30 p.m. on Monday, August 28, 2017 in the Boardroom at the Joaquin ISD Administration Building. The purpose of this meeting is to discuss the school district’s 2017-2018 Budget and proposed Tax Rate. Notice is hereby given that on the 28 th day of August 2017 the Board of Trustees of the Joaquin School District will hold a special meeting at 6:00 p.m., at the Administration building, Joaquin, Texas. Faculty members of the Stephen F. Austin State University School of Music will be the featured performers during the annual Pi Kappa Lambda Music Faculty Showcase at 7:30 p.m. Thursday, Sept. 21, in Cole Concert Hall on the SFA campus. Each year, musicians select a wide range of musical styles and perform in a variety of solo and ensemble settings. Concert proceeds will benefit the Pi Kappa Lambda scholarship presented annually to the sophomore music major with the highest grade point average. Tickets are $12 for adults, $8 for seniors and $5 for students. For tickets or more information, visit www.finearts.sfasu.edu or call (936) 468-6407 or (888) 240-ARTS. Notice is hereby given that on the 28th day of August 2017 the Board of Trustees of the Joaquin School District will hold a special meeting at 6:00 p.m., at the Administration building, Joaquin, Texas. Ronnie Belrose, Vice-President, called the meeting to order at 6:10 p.m.
2 The invocation was led by Bill Mason, Jr., and the Pledge of Allegiance to the United States of America by Thomas Harvey, and the Pledge of Allegiance to the Texas Flag was led by Jeff Cater. 4.1 The board entered closed session in accordance with the Texas Open Meetings Act, Texas Government Code Section §551.071 & §551.074 at 6:33 p.m. on August 21, 2017. 5.1 The board entered open session in accordance with the Texas Open Meetings Act at 7:58 p.m. on August 21, 2017.
vote was taken on the motion. It carried unanimously. 7.1 It was moved by Tam Hearnsberger, and seconded by Brandon Neal, to approve the minutes fromprevious month’s meeting. Following discussion, a vote was taken on the motion. It carried unanimously. 7.2 It was moved by Jeff Cater, and seconded by Tam Hearnsberger, to approve engagement letter with Goff & Herrington, P.C. certified Public Accountants for annual auditor services(attached). Following discussion, a vote was taken on the motion. It carried unanimously. 7.3 It was moved by Bill Mason, Jr., and seconded by Brandon Neal, approve TASB Local Policy update for District of Innovation in accordance with TASB’s instruction sheet. Following discussion, a vote was taken on the motion. It carried unanimously. 7.4 It was moved by Tam Hearnsberger, and seconded by Brandon Neal, approve JISD Appraisers for 17-18 School Year (attached). Following discussion, a vote was taken on the motion. It carried unanimously. 6 Ronnie Belrose, Vice President, asked for items to be placed on the next board agenda. 8 With no further business on the agenda the meeting was adjourned at 8:04 p.m. The first CMS BETA meeting will be August 24 at 5:30 PM at CMS Cafeteria. All students participating in BETA this year must attend this meeting. Parents/guardians are asked to attend. Change Oil & Lube, etc. card from a student athlete by Monday, August 28. Meet the Teacher is From 4:30-6:00 on Thursday August 24th. -Football Scrimmage this Friday is AWAY at Queen City at 5:00 p. not here. -High School Varsity Volleyball Game this Friday Here vs. Garrison at 4:30. The City of Nacogdoches, SFA’s Arthur Temple College of Forestry and Agriculture, and the Texas A&M Forest Service will host a public tree care seminar from 9 a.m. to 3 p.m. Saturday, Aug. 26, in the Forestry Building, Room 117, on the SFA campus. This free workshop aims to teach community members about the best management practices that apply to the planting and maintenance of trees and vegetation to comply with the Development Standards Section Ordinance for native tree species of Nacogdoches. Additionally, tree physiology, as well as how to protect trees before, during and after construction, will be addressed. This seminar is focused on providing homeowners, business owners, tree care and landscape companies, commercial developers, city planners and community members with valuable information related to the care and conservation of Nacogdoches’ trees. SFA faculty and staff members are invited to attend the opening of the academic year meeting tomorrow. Refreshments will be served beginning at 7:30 a.m. in the Spirit Lounge on the first floor of the Baker Pattillo Student Center, and the meeting will begin at 8:30 a.m. in the Grand Ballroom. New members of the SFA community will be introduced, accomplishments of the previous year will be highlighted and plans for the upcoming year will be discussed. SFA's New Faculty Orientation Committee invites faculty members to attend a casual evening social and dinner from 6 to 8 p.m. tonight at the Cole Art Center, located at 329 East Main St. The event will allow participants to meet and welcome SFA’s new faculty members. Thurs. Aug. 24 – Meet the Teachers – 4:30 p.m. – 6:00 p.m.
Mon. Aug. 28 – First Day of School. Please watch for buses. 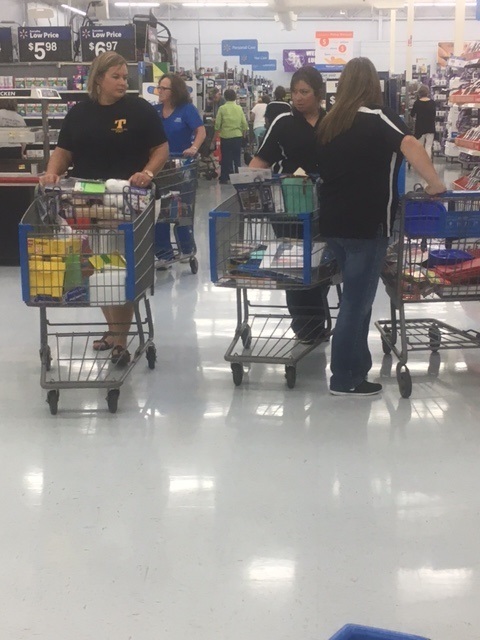 ------------TMS Volleyball vs. Carlisle – Away @ 4:30 p.m.
TISD Staff Trip – The Timpson ISD teachers traveled to WalMart in Nacogdoches last week. Each teacher got to purchase two hundred dollars of student and instructional supplies for their classrooms. Following the shopping, staff enjoyed a meal together at Clear Springs and Auntie Pasta’s before returning to school. The teachers express their appreciation to the administration and school board for making the trip possible. TMS Volleyball News - Please see attached for Timpson Middle School volleyball news. Lady Bear Volleyball Update - The Timpson Lady Bears finished 3rd out of 24 teams this past weekend at the West Rusk Tournament. They are now 10-5 on the season. Congrats Lady Bears! This week the Varsity and JV Lady Bears will be playing in Ore City on Tuesday and the Varsity will play at home against Garrison on Friday at 4:30. TISD Meet The Teacher - Timpson ISD will host Meet the Teacher Thursday August 24 on all three campuses from 4:30 to 6:00 p.m. All parents are invited to attend. Elementary students may bring their school supplies. It's back to school for all Tenaha ISD students on August 28th! Parents and students please remember that there is a new bell schedule. do not drop students off prior to that time. staff with donuts, coffee and their own enthusiasm for the new semester. announce the 2017 faculty and staff grant recipients. grant recipients forward to accept their award. as well as helping athletes. biology models for the Marshall campus lab. the purchase of new netting systems for the baseball team. II Volleyball Machine for training. purchase two portable speakers for the music department to share at events. with an electric bed, wheel chair, and durable supplies. equipment to help the Medical Assistant program. received $9,969 to obtain a VitalGo Total Lift Hospital Bed. cosmetology students to a Make-up show in Dallas with their grant of $3,050. 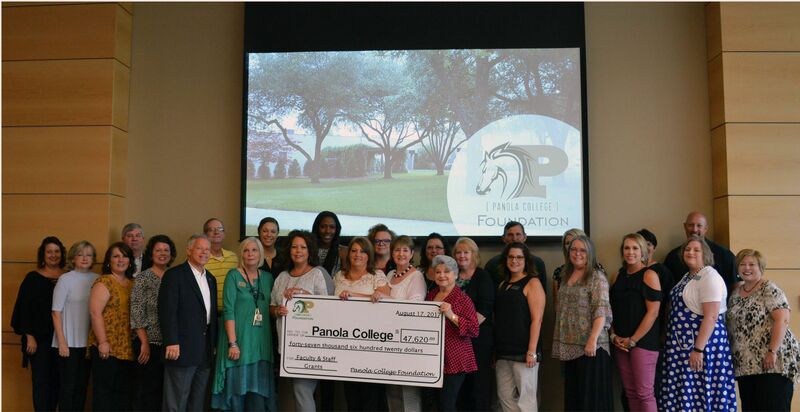 at www.panola.edu/panola-foundation, or by calling 903-693-2029. The Alazan Trio at Stephen F Austin State University will perform romantic piano trios when the faculty ensemble presents a recital at 7:30 p.m. Friday, Sept. 8, in Cole Concert Hall on the SFA campus. Comprised of School of Music faculty members Jennifer Dalmas, violin; Evgeni Raychev, cello; and Ron Petti, piano, the trio will perform the music of German composers Clara Schumann and Johannes Brahms. The Stephen F. Austin State University School of Art and the Friends of the Visual Arts will present a free, one-night screening of “The Barkley Marathons: The Race That Eats Its Young” at 7 p.m. Friday, Sept. 1, in The Cole Art Center @ The Old Opera House in downtown Nacogdoches. The documentary, directed by Annika Iltis and Timothy James Kane, is about a cult-like race in Tennessee with an ever-changing and unmarked course that tempts people from around the world to test their limits of physical and mental endurance. The Heterodyne Duo at Stephen F. Austin State University will open the all-new Calliope Concert Series for the SFA School of Music at the start of the fall semester. The faculty duo, featuring Dr. Brad Meyer, director of percussion studies at SFA, and Dr. Nathan Nabb, professor of saxophone, will perform at 7:30 p.m. Monday, Aug. 28, in Cole Concert Hall in the Wright Music Building on the SFA campus. 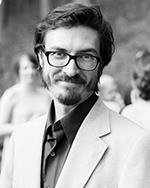 The program will feature compositions by Nathan Daughtrey, Alex Mincek, Marc Mellits and Iannis Xenakis. year by presenting a special pass. The CHS Alumni Association would like to congratulate our newest Hall of Honor Inductees. The Center varsity football team has a home game vs. the Tatum Eagels (TX) on Thursday, August 24 @ 7p. The Shelbyville varsity football team has a home game vs. Elkhart Elks (TX) on Friday, September 1 @ 7:30p. 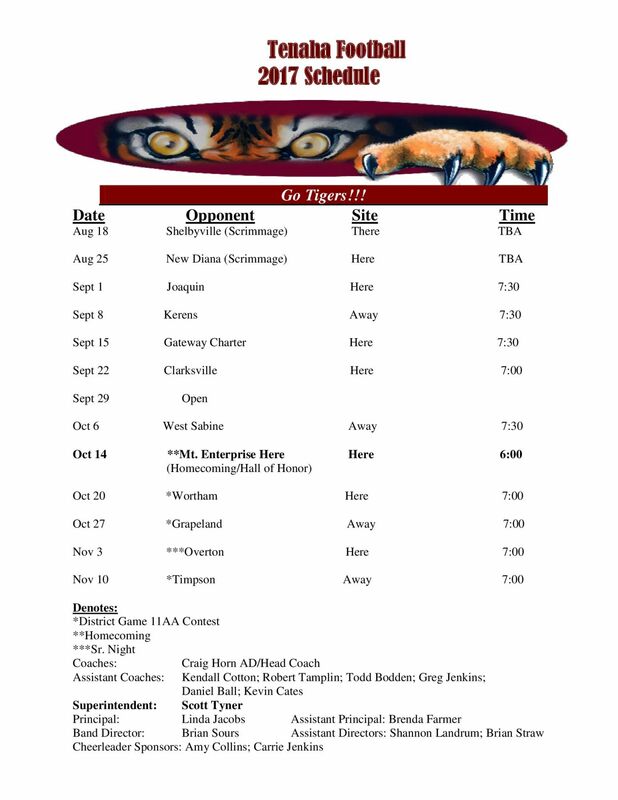 The Timpson varsity football team has a home game vs. West Sabine Tigers (Pineland, TX) on Friday, September 1 @ 7:30p. The Tenaha varsity football team has a home game vs. Joaquin Rams (TX) on Friday, September 1 @ 7:30p. CHS Homecoming Pep Rally - will be Friday, September 15th at 3 p.m. in the CHS Gym. CHS Homecoming Game - will be Friday, September 15th at 7:30 p.m. vs. Gladewater. CHS Annual Alumni Association Meeting - will be Saturday, September 16th at the Windham Civic Center. will be streaming the event in her classroom. On Monday, August 21, 2017, all of North America will be treated to an eclipse of the sun. Anyone within the path of totality can see one of nature’s most awe-inspiring sights - a total solar eclipse. This path, where the moon will completely cover the sun and the sun's tenuous atmosphere - the corona - can be seen, will stretch from Lincoln Beach, Oregon to Charleston, South Carolina. Observers outside this path will still see a partial solar eclipse where the moon covers part of the sun's disk. Notice is hereby given that on the 21st day of August 2017 the Board of Trustees of the Joaquin School District will hold a regular meeting at 6:00 p.m., at the Administration building, Joaquin, Texas. 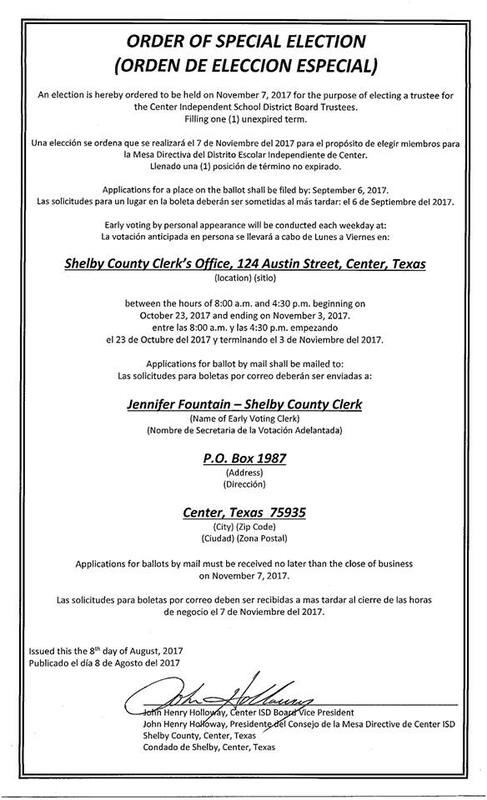 contact Donna Vergo at (936)269-3128 ext. 225. The Center Lil' Riders Punt, Pass and Kick Camp today at 5:00 p.m. at the Roughrider Stadium. be donated to CASA of East Texas." The Stephen F. Austin State University College of Fine Arts and School of Theatre will present Molière’s “Tartuffe” at 7:30 p.m. Tuesday through Saturday, Oct. 3 through 7, in W.M. Turner Auditorium on the SFA campus. Molière created literature’s most memorable con artist – and one of the funniest plays ever written –more than 350 years ago. Tartuffe boasts lavishly of his religious piety and moral purity, but everyone can see that his behavior is absurdly hypocritical. Everyone, that is, except Orgon, the all-powerful father of the house where Tartuffe has taken up residence. His family lays a trap for the imposter, but will they catch the Baroque-era sleazeball before he swindles them out of everything they’ve got? Tickets are $15 for adults, $10 for seniors and $7.50 for students and youth. For tickets or more information, call the SFA Fine Arts Box Office at (936) 468-6407 or visit www.finearts.sfasu.edu. SFA faculty and staff members are invited to attend the opening of the academic year meeting Thursday, Aug. 24. The SFA Alumni Association will honor six alumni during its annual awards banquet beginning at 6 p.m. Friday, Sept. 8, at The Fredonia Hotel in Nacogdoches. The Alumni Association awards its highest honors to individuals who have made outstanding contributions to their professions and the community and who advance the goals and values of SFA. The association named the following as its recipients of the 2017 Alumni Awards: James Dickerson, Steve McCarty and Dr. Walter “Mike” Robertson, Distinguished Alumni; Julie Woods, Outstanding Young Alumni; Sydni Mitchell, Lumberjack Pride Award; and Dr. Michael Tkacik, Distinguished Professor. Tickets to the Alumni Awards ceremony and dinner are available through Sept. 1 for $50 per person and $500 for a table of 10. For more information or to purchase tickets, contact Jennifer Sowell, assistant to the executive director, at (936) 468-3407 or sowelljm1@sfasu.edu. Volleyball versus CHLV/Ore City at Ore City JV/V 4:00 p0.m. Football Scrimmage this Friday here at 5:00 p.m.
Timpson Lady Bears have already begun the season and have started off strong. The Lady Bears opened the year will Dual Match against Tyler-Cumberland Academy and Center winning both games in straight sets. The Lady Bears then competed in the Gary Tournament where they had wins against Center, Kilgore, Harmony and lost to Huntington, North Zulch, and Sabine. The Lady Bears are now 5-3 on the season. They play next Tuesday in Ore City and will be at the West Rusk Tournament this weekend. The JV Lady Bears competed in the Gary Tournament as well winning two games against Tatum and Union Grove and losing one to Elysian Fields. The JV Lady Bears are now 2-1 on the season and will be in Ore City tomorrow and West Rusk this weekend. Center Riders vs Kirbyville Wildcats in Kirbyville, this Friday at 6:30 p.m.
Joaquin Rams vs Logansport Tigers, home game in Joaquin this Friday at 7:00 p.m.
Timpson Bears will have a home game vs Groveton Indians this Friday August 18th at 5:00 p.m. The Shelbyville Dragons will have a home game vs the Tenaha Tigers this Friday at 6:00 p.m. The Garrison Bulldogs will have a home game vs Arp Tigers this Friday at 6:00 p.m.
Freshmen & JV @ 5:00 p.m.
Chrisco Bragg, President, called the meeting to order at 6:03 p.m.
2 The invocation was led by Chrisco Bragg, and the Pledge of Allegiance to the United States of America by Thomas Harvey, and the Pledge of Allegiance to the Texas Flag was led by Tam Hearnsberger. The board entered closed session in accordance with the Texas Open Meetings Act, Texas Government Code Section and §551.074 at 7:49 p.m. on July 7, 2017.
recommendation of the Superintendent to hire Joe Hooper on one year probationary teacher contracts subject to assignments. Following discussion, a vote was taken on the motion. The vote was 4 for and 1 against (Thomas Harvey). on the motion. It carried unanimously. rate. Following discussion, a vote was taken on the motion. It carried unanimously. August 21, 2017 at 6:00 p.m.
9 With no further business on the agenda the meeting was adjourn at 8:41 p.m.
A regular meeting of the Board of Trustees of Center Independent School District (CISD) was held on Tuesday, August 8, 2017 beginning at 12:00 p.m. at Center High School Agriculture Science Building located at 658 Roughrider Drive in Center, Texas 75935. John Henry Holloway called the meeting to order at 12:00 p.m. and declared a quorum. Makayla Mayo gave the invocation and Maddie Russell led the Pledges of Allegiance. The first draft of the 2017-2018 budget was presented and discussed. A motion was made by Matthew Mettauer, seconded by Daphne LaRock to approve the notice of public meeting to discuss budget and proposed tax rate on August 31, 2017 at 12:00 p.m.
“I move that the Board of Trustees of Center ISD approve the Notice of Public Meeting to discuss the 2017-2018 budget and proposed tax rate. The meeting will be held at 12:00 noon on Thursday, August 31, 2017 at the Center ISD Administration Office. The proposed Operating budget is $22,917,867. The proposed Interest and Sinking (I&S) budget is $1,237,400. The proposed Maintenance & Operation (M&O) tax rate of $1.1700 and the proposed I&S tax rate of $.1638 for a total tax rate of $1.3338. A motion was made by Traci Willoughby, seconded by Matthew Mettauer to approve the consent agenda consisting of the minutes from the regular meeting on July 27, 2017, the 2016-2017 School Health Advisory Committee (SHAC) Report and the budget amendments. Allison Johnson was appointed as the delegate and Traci Willoughby as the alternate delegate for the upcoming TASA/TASB Conference 2017. A motion was made by Matthew Mettauer, seconded by Traci Willoughby to order a Special Board Trustees election on November 7, 2017. The 2016-2017 state accountability ratings were presented. John Henry Holloway called for a closed session at 12:23 p.m. under Texas Government Code §551.074 and §551.072 for consideration of employment of contracted personnel, resignation/retirement, extended emergency sick leave and compensation and benefits. The Board returned into open session at 12:58 p.m. No action was taken in closed session. 11.1.1 No action required by the Board as the Superintendent was granted contractual authority on June 1, 2017. 11.1.2 No action required by the Board as the Superintendent was granted contractual authority on June 1, 2017. 11.14 A motion was made by Matthew Mettauer, seconded by Daphne LaRock to approve the 2017-2018 compensation increases as recommended by the Superintendent. A motion was made by Traci Willoughby, seconded by Daphne LaRock to adjourn the meeting at 12:59 p.m.
Heather Samuelson and Haley Jameson, co-coordinators of SFA’s dance program, presented research at the Twelfth International Conference on the Arts in Society in Paris, France. Samuelson’s poster presentation, “Expression of the Forbidden: Creating dance that explores eating disorders and self-mutilation,” is based on a dance she choreographed titled “M.E.,” which depicts eating disorders and self-mutilation. Jameson’s poster, “Teaching Social Responsibility Through Dance Appreciation," focused on her teaching practice in dance appreciation classes at SFA. Jameson uses social responsibility as the framework to look at dance through the lens of a non-discrimination statement in her dance appreciation courses. SFA Gardens will host Permaculture Design 101 with Theron Beaudreau from 9 a.m. to noon Aug. 26 at the Brundrett Conservation Education Building, located at 2900 Raguet St. 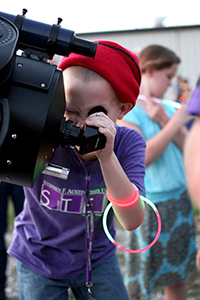 Recently, participants in SFA’s Lil’ STEM Jacks, a two-day outreach program offered within the College of Sciences and Mathematics’ STEM Research and Learning Center, had an out-of-this-world experience as they traveled to the SFA Observatory for a constellation party. “We were so excited to have our Lil’ STEM Jacks at the observatory. The students were able to see so much more by using technology. The iPads gave them the ability to explore and see what they wanted to see,” said Julie Sandifer, kindergarten through 12th grade outreach coordinator for SFA’s STEM Research and Learning Center. Ranger "Camo" Crew 900 as the prize. located at Center High School or from any Booster Club member. for viewing. A photo is attached. State law requires all students be current on their immunizations before attending school. Shelbyville ISD will be offering an Immunization Clinic to students enrolled in classes for the 2017-18 year. The Clinic will be held during “Meet the Teacher,” August 24, 2017, between the hours of 3:30 – 5:30 PM… Immunizations will be available to ALL students… Parents should bring a current copy of student’s immunization record and, if student is insured, bring insurance card. For more information you may contact the school nurse, Jeane Taylor at 936 598-7363. Students who are not up-to-date on immunizations will not be allowed to attend classes, until the immunizations are complete. S. W. Carter Elementary School will have pre-registration for new students moving into the district (pre-k-5th grade) August 14th - 17th from 8:00 a.m. until 3:00 p.m. Please bring your child’s report card, immunization record, certified birth certificate, social security card and proof of residency. Notice is hereby given that on the 7th day of August 2017, the Board of Trustees of the Joaquin School District will hold a special meeting at 6:00 p.m., at the Joaquin ISD Administration building Board room, Joaquin, Texas. 551.083 Considering the standards, guidelines, terms, or conditions the board will follow, or will instruct its representative to follow, in consultation with representative of employee groups. 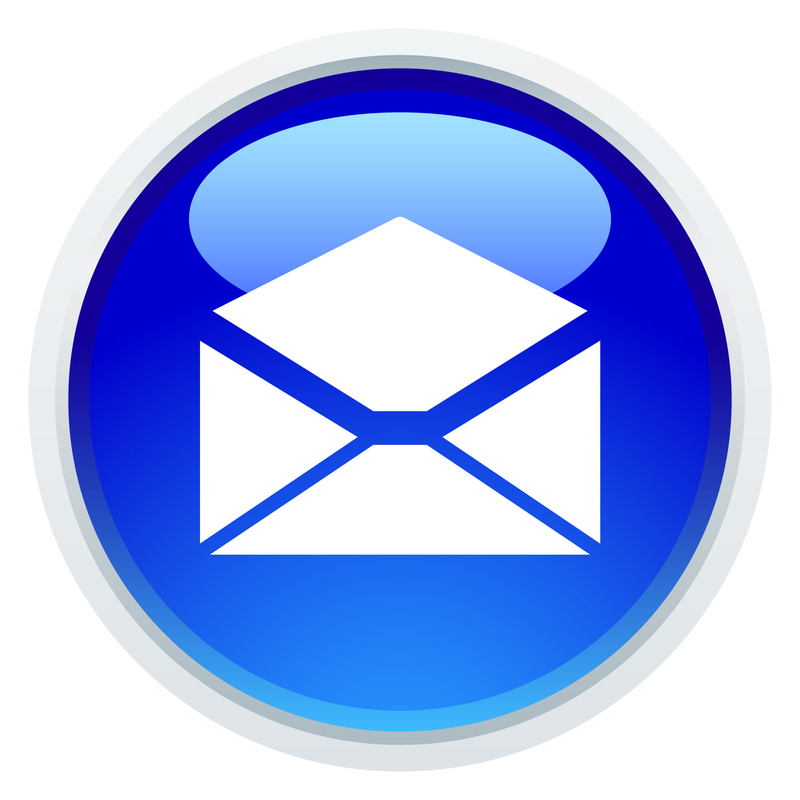 Set date for Public Meeting to Discuss Budget and Proposed Tax Rate – August 28th at 5:30 p.m.
Shelbyville Athletic Boosters meeting Monday, August 7th at 5 p.m. in room 101 in the Elementary building. returning and we can have continued success.” He added. points per game and had a season high 19 points against Bossier Parish. recorded 9 double-doubles throughout the season. shooter led his team to the areas #1 ranking. game and made the Daily Southtown all-area team. of the week his senior year. year at Tennessee Prep where he nearly averaged a double-double. game. In high school, Alex was an all-conference and all district player. Known as an elite level defender, Alex almost averaged 5 blocks a game. scoring and rebounding output while at TAGG. on the circuit averaging over 18 points per game. Juwan sat out last season after playing his freshman year at Weber State. 2013, 5A state championship team. Joaquin ISD Meet the Teacher is scheduled for Thursday, August 17th from 5:30 - 7:30 pm for all campuses. All students and parents are invited to attend.